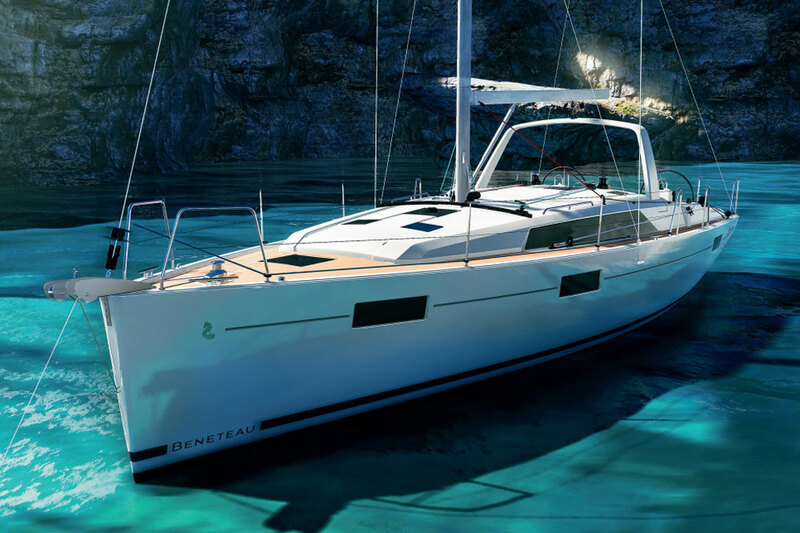 Optimized cruising features will suit savvy sailors aboard Beneteau’s new Sense models. 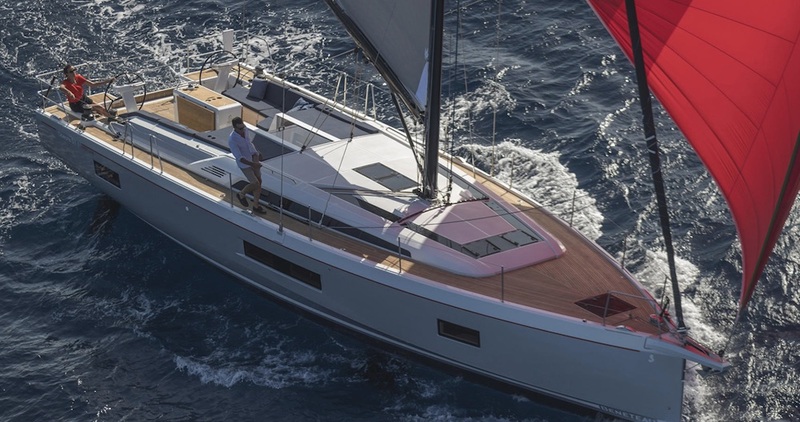 You may already know about Beneteau’s sailboats in the Sense line, which we've written about previously—Sense 46, Sense 50, and Sense 55—but the time is coming to take a fresh look. The French builder is relaunching the line at this winter’s U.S. boat shows. It's common sense: the Sense line offers almost everything that any seasoned sailor has on their "wish" list. Deemed revolutionary in 2010 when the first Sense 50 wowed show-goers in Annapolis, the line was innovative and impressive. North American boaters were intrigued by the idea of the “monomaran” with its massive cockpit and open transom. The layout also capitalized on the idea of moving loud machinery away from the interior living spaces by situating it under the cockpit. The interior, with three gently sloping (45-degree) companionway steps and cabins clustered together in the forward end of the hull, were unique. But the Sense approach was a polarizing concept. Those who had spent extensive time aboard with family tended to love it; those looking for multiple cabins under the cockpit shied away. 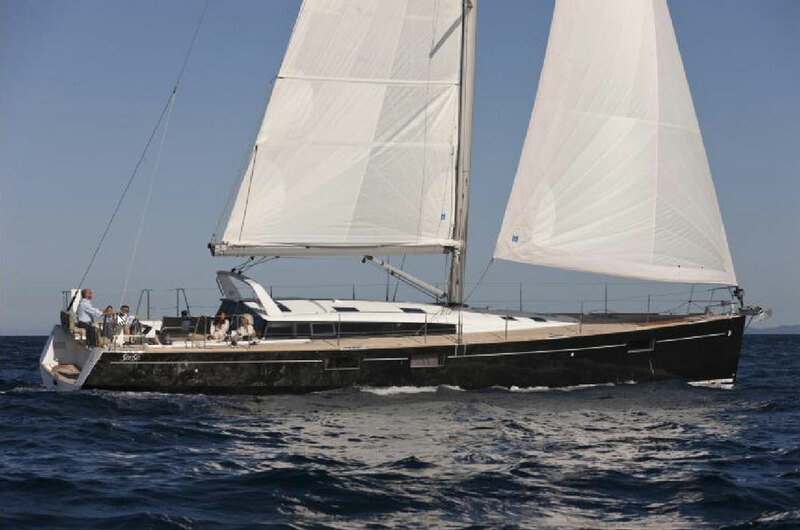 The Sense line started with the launch of the 50 and then quickly added 55, 46 and 43 footers. But the Sense models command as much as a 15-percent premium, and the larger boats were getting more takers than the smaller vessels. 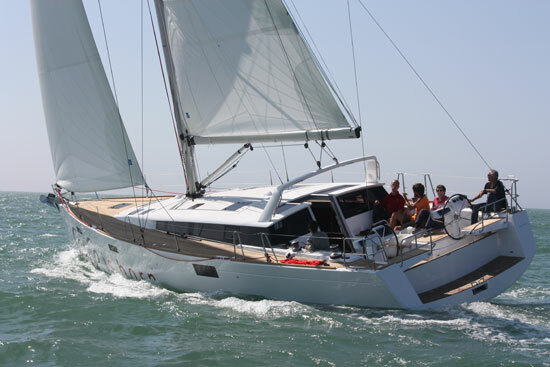 As a result, Beneteau has discontinued both models in the 40-foot range and will now introduce two new boats at 51 and 57 feet. Although the wide and open transoms had a jaw-dropping effect at boat shows, once in use away from the dock, some potential buyers felt they were dangerous, especially for kids and pets. 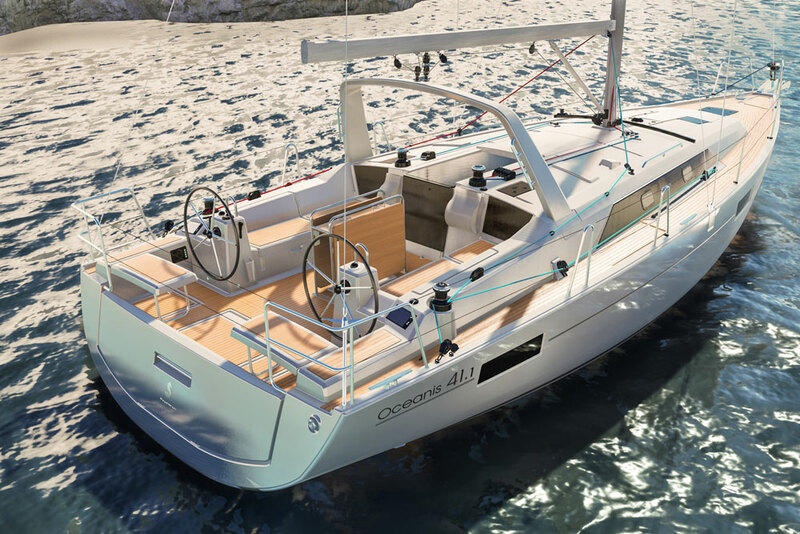 Beneteau has responded with a neat solution: Gone are the helm seats that lifted up and outboard to reveal a completely open aft end, replaced by two fixed seats and an electrically activated hydraulic transom. 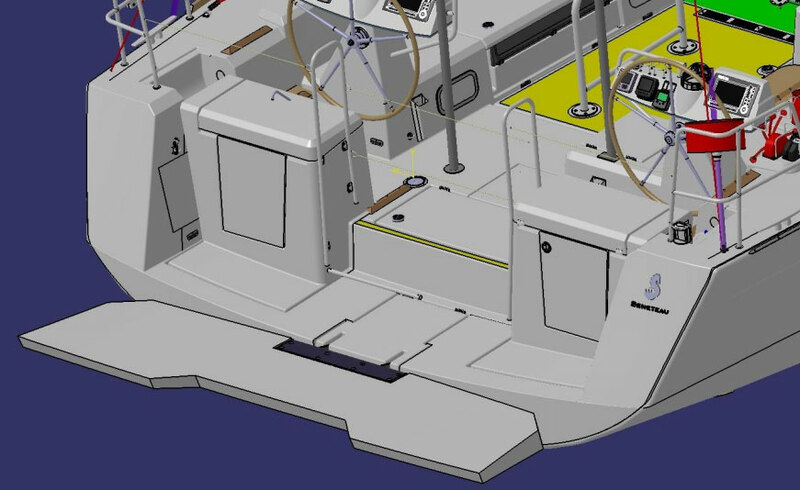 The benefit is added safety as the transom now provides a backstop for anything that might want to slide out when under way. Another benefit is that when lowered, the transom forms a teak beach that extends the cockpit and provides nice access to the water or the dock. Nestled within the newly added helm seats is a galley module. To starboard is an electric Eno grill and to port is a sink and prep station. Now you'll be able to stand on the small aft deck, which is just ahead of the teak beach when the transom is lowered, and prepare dinner. It’s a great way to entertain, as the chef can interact with those in the cockpit but still have his or her dedicated work space. With the transom dropped down in the "teak beach" position, the Sense has easy access to the water. The aft corners of the hardtop have been angled inward, leaving the port and starboard quarters of the boat free for those waiting to toss a line onto the dock, especially in the case of a Med mooring. 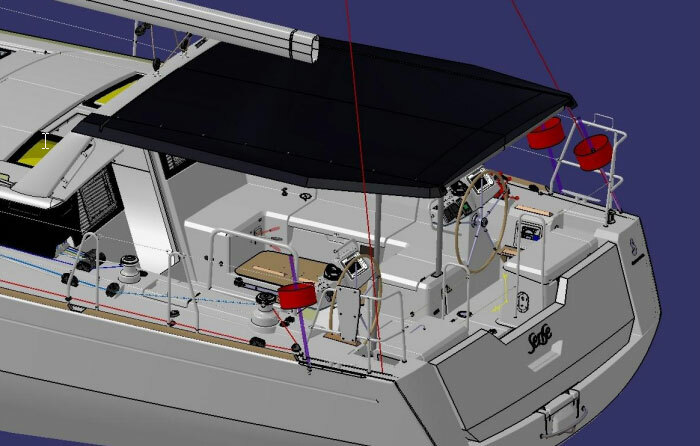 Beneteau is also working on a new hardtop approach that will cover the cockpit all the way back to the helm stations. The composite top extends back from the arch that attaches the mainsheet. The rigid sides extend laterally out to just above the winches, while the middle is made of canvas, which opens and closes like an accordion sunroof, so you can have the cockpit completely covered or open to the sun and breeze. A dodger can still be added from the arch forward. Overall, the new hardtop is a clever and workable design that minimizes the amount of canvas, which is a nuisance to replace periodically aboard a vessel that voyages to foreign ports. The inboard supports also make excellent vertical handholds when moving about in the aft part of the cockpit. The Sense interior was revolutionary when introduced. The concept created open spaces that didn’t feel buried in the hull and the quiet cabins were moved away from onboard machinery. In this, the Sense holds to its initial innovations. Like the 50, the 51 offers two cabins and heads with a third room that can be either an over/under bunk cabin or an office. The 57 looks much like the 55, with three cabins and three heads. The saloon and galley layout also remain the same but the finishes have been changed up throughout. 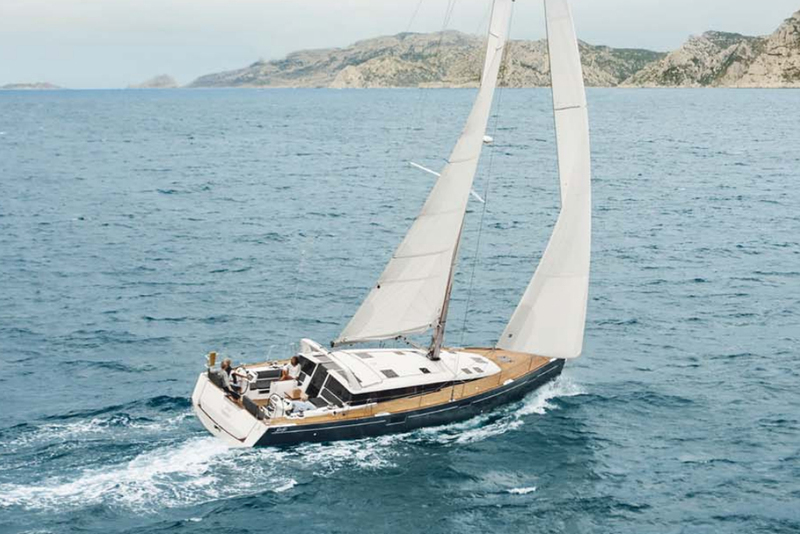 Beneteau added a new, richer Alpi walnut color wood with a deeper tone to the trim paint. The cabinetry is more elegantly finished at the edges, and the locker faces can now be either light lacquered finishes or a continuation of the wood tones. With their new Italian head of product planning and development, Gianguido Girotti, Beneteau is adding a stylish luxury to their yachts. For anyone who may have heard that the Sense was a dockominium, I recommend going for a sail. I tested the Sense 50 in light winds when it was introduced and I thought it sailed well with the wide sections using the hard chine to stay upright, even in a blow. Now for improved downwind performance, a long bowsprit has been added to carry a Code 0. It elongates the boat, giving it an aggressive look as well as providing more room for the anchor roller. 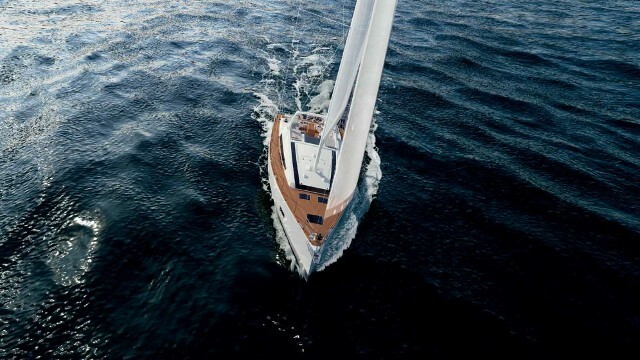 With two choices of keel and incredibly sleek profiles, both new models in the line are expected to perform well but still be well-mannered and easy to manage when sailed by a cruising couple. Auxiliary power sources have also been announced. Under power, the Sense 57 will have a choice of two engines: An 80 HP Yanmar diesel with Saildrive or a 110 HP Yanmar with a straight shaft. (Saildrive is not yet available on engines over 100 HP). The 51 will offer an 80 HP Yanmar with Saildrive. Beneteau’s revolutionary Dock ‘n Go is expected to be re-introduced as Yanmar’s 80 HP engine clears EPA requirements. At the risk of writing yet another pun regarding the name, the Sense now makes even more sense, particularly as a go-far boat. With nearly 200 gallons of fuel and 100 gallons of water (an extra tank and watermaker may be added), a genset, and slightly larger engines, the boats have the ability to go just about anywhere. Sailors who have spent time away from the dock, both under sail and at anchor, will appreciate the practical as well as the aesthetic changes. New safer transoms, a sprit for a more versatile downwind sailplan, larger but more fuel-efficient engines to get you home quickly, an entertainer’s outdoor galley, a refreshed stylish interior and a protective and functional hardtop enhance both the performance and the comfort of the line. I know I’ll be looking to sail one as soon as they arrive at U.S. docks, sometime in early 2017. To view listings for the new Sense models when they become available, search for Beneteau listings in Boats for Sale, then click on “More” under “model,” then choose the letter “S” under “Browse all Models."